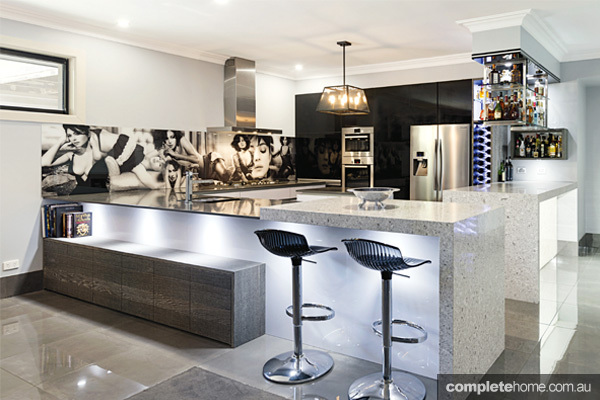 This classic kitchen, designed by Lindsay Williams of the Mint Kitchen Group, brings together functionality and traditional styling with a modern touch. Located at the centre of a double-fronted solid brick period home, this new kitchen is light, bright and spacious, matching beautifully with the traditional styling of the home and furniture. 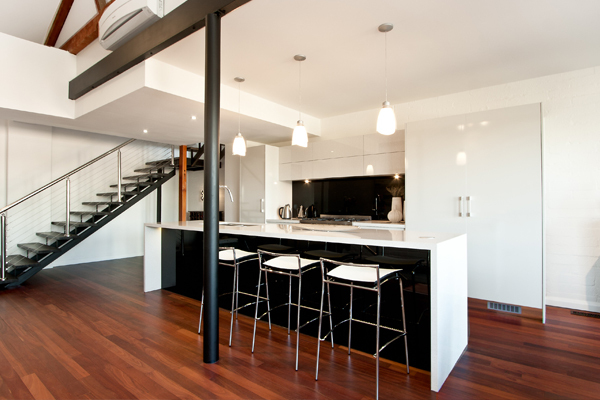 To achieve this design, a large brick chimney in the original kitchen was removed to open the space. 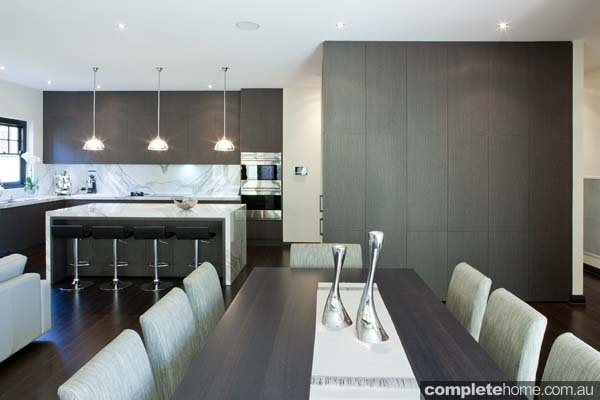 The entrance to the kitchen was relocated, making room for the tall units while creating a better flow between the kitchen and adjoining formal dining room. 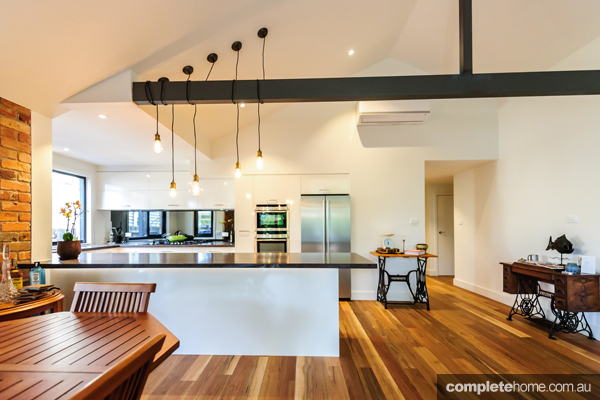 A new reclaimed Baltic pine floor was laid to match the existing boards and a skylight was included to ensure brightness and lighting efficiency. 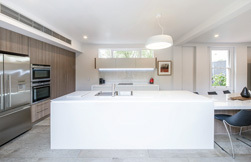 The kitchen features vinyl wrap shaker-style doors and panels in Alabaster matt finish and the reconstituted quartz benchtops are finished in French Nougat to match. 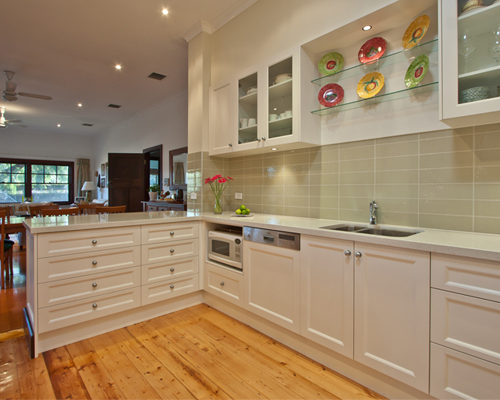 Handles are brushed stainless-steel knobs in keeping with the traditional style of the cabinets. 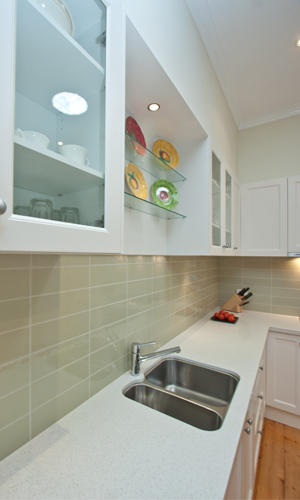 The overhead cabinets either side of the sink feature clear glass inserts for glassware display, while a recessed plate rack with glass shelves ties the overheads together nicely. 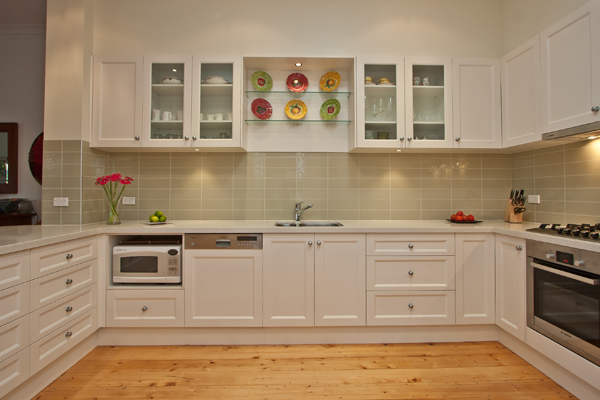 Downlights installed above the glass shelves make this the perfect place to display treasured kitchen items. Additional downlights installed beneath the overheads ensure plenty of task lighting where it is needed most. 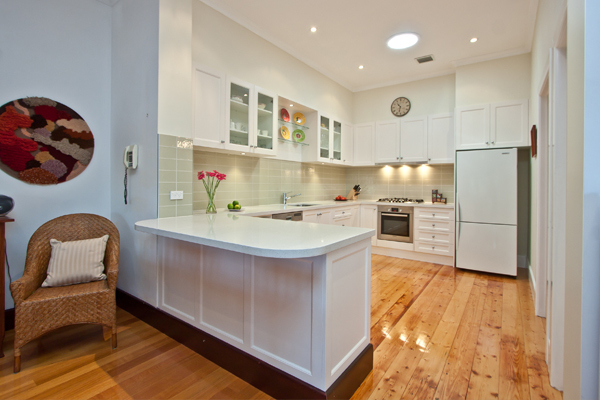 Other features include an integrated dishwasher and undermount sink for maximum bench space. 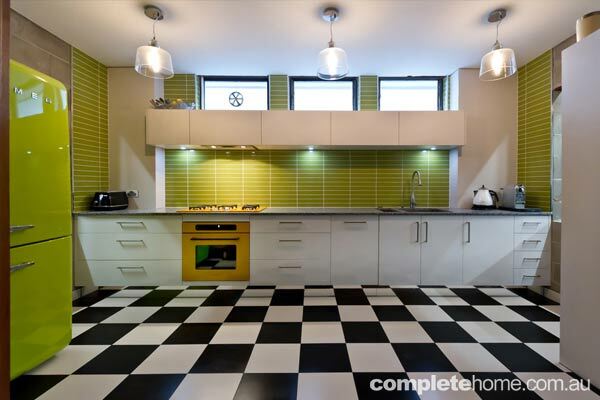 The design includes two banks of wide drawers under the breakfast bar for easy access to all crockery and serving ware. The many drawers throughout the kitchen feature full-extension soft-close runners, ensuring the most functional use of storage space available. 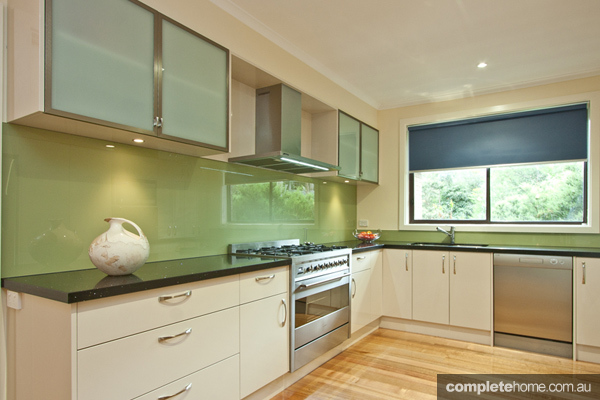 A Murano glass-tiled splashback provides a final eloquent finishing touch to this classic traditional design. Chosen in a silvery-grey shade, the tiles feature a high-gloss dappled surface and stain-resistant grout for easy cleaning. 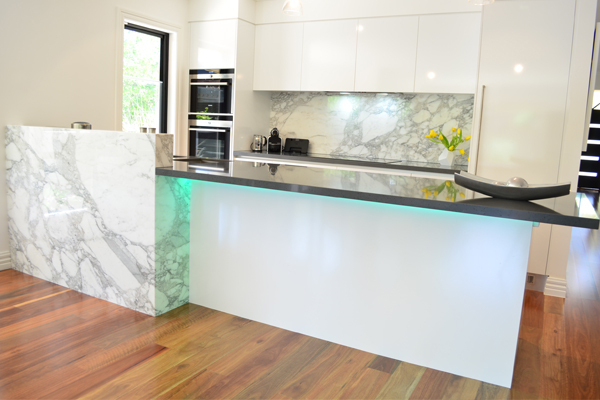 The result is another stunning kitchen by the Mint Kitchen Group that reflects the contemporary and individual style of the clients, while providing them with function and durability for years to come. 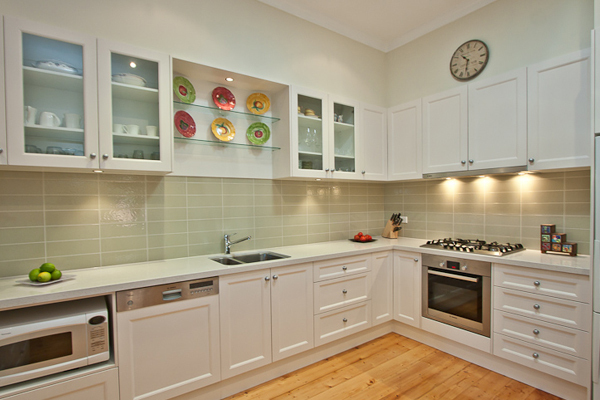 Downlights installed above the glass shelves make this the perfect place to display treasured kitchen items.